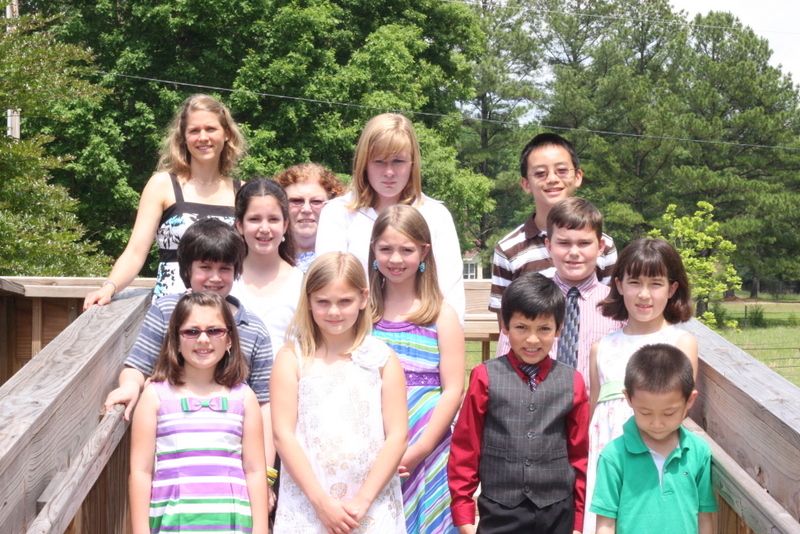 My music studio's 2011 Spring Recital was a successful and enjoyable event. As usual, my students chose to play music that was unique to their taste and on this recital we had a lot of fun selections including a number of jazzy pieces. If your child performed in this recital and you would like a photo, I can email you a copy. Congratulations to Grace McMullen for placing as a finalist at the graduating senior level in the Charlotte Piano Teacher's Forum Auditions! She will be performing one of her contest pieces at an awards recital in May. Grace has been taking piano from me since she began about nine years ago. Now she will be going to college this fall where she plans to continue her study in piano. I'm proud of you Grace! You will be greatly missed! Congratulations to my flute students who played in 2011 Festival! Congratulations to Michael Yang and Emily Wilkens for getting superior ratings in the 2011 Festival Flute Solo Event! You both played beautifully! Congratulations to my 2011 Hymn Playing Festival Students! Congratulations to Daniella and Nico Longhi, and Jenna Grace Whelan for receiving a Superior rating in the 2011 Hymn Playing Festival. Well done! Congratulations to all those who participated in my studio's 2010 Winter Recital. I am so proud of every one of you, especially if you were nervous and played anyway! If you would like a picture of yourself or your child performing, send me an email and I will send you a picture. On Saturday, November 20th four of my flute students and four of Christina Beekman's cello students played for an open house event in Waxhaw. Christina and I also performed flute and cello, and double cello duets. We had fun and I think everyone did a great job. Congratulations to Vivace Strings for a great end of the year performance at St. Peter's Episcopal Church on Saturday, November 13th at 7:30pm. As a group you all did a great job, and I know the individual effort each of you put into this performance. I am proud of you all! Vivace Strings did a great job playing at Deer Stone Lodge on November 6th. Visit the USYO website for more photos. Volunteer Opportunities: Volunteer to help the Charlotte Piano Teacher’s Forum with the Concerto Auditions or the Solo Auditions and receive lots of volunteer hours for school and the satisfaction of helping the music community. Let me know if you would like to volunteer or have any questions about what it involves. Festival Hymn Playing Event: DATE: Saturday, February 5, 2010 PLACE: Matthews United Methodist Church, 801 South Trade Street, Matthews, NC TIME: Your child's time to play will be announced one week before the Festival. REPERTOIRE: The student will perform two hymns from the required Federation List (with music) for the judge. Federation Hymn Playing is a NON-COMPETITIVE event, meaning that students are not compared with each other, they are simply critiqued on how accurately they express details of the music as it is printed. Festival Piano Scholarship (Charlotte District): DATE: Saturday, February 12, 2010 PLACE: Queens University of Charlotte E.H. Little Fine Arts Center, corner of Selwyn and Wellesley Avenues TIME: Your child's time to play will be announced one week before the Festival. REPERTOIRE: The student will perform two pieces from memory. One piece is from the required Federation List, the second piece from a non-American composer. Student must play a piece from the higher levels of the Federation list, beginning with the Moderately Difficult I. SCHOLARSHIP: Students who place (1st or 2nd in their category) at the District Level have the opportunity to compete for a scholarship on the state level on April 17th at UNC Greensboro. Festival Piano Solo Event: DATE: Saturday, February 26, 2010 PLACE: First Baptist Church, Queens University, and CPCC TIME: Your time to play will be announced one week before the Festival. REPERTOIRE: The student will perform two pieces from memory. One piece is from the required Federation List, the other is taken from appropriate classical repertoire chosen by the teacher and student. Federation Festival is a NON-COMPETITVE event, meaning that students are not compared with each other, they are simply critiqued on how well they express what the composer has written on the page. There are now pictures available of our Vivace Strings performance at the Bravo! Beethoven concert on October 10, 2010, and the Art Walk in downtown Monroe on October 1, 2010. The Charlotte Area Foundation for Music and Handcrafted Art presents a chamber music concert featuring Kellan Toohey on clarinet with the Union Symphony String Players performing the Quintet for Clarinet and Strings by Brahms. There will also be performances by the Master’s Musicians String Ensemble, Tamar Rowe on harp, Timothy Dinsmore on guitar, and the Union Symphony Youth Chamber Players, Vivace Strings. The concert will be held on Saturday, November 13th at 7:30pm at St. Peter’s Episcopal Church on the 2nd floor parish hall. The church is located at the corner of Tryon and 7th St. There is free parking behind Red Rocks Cafe. Tickets are $10 and a reception will follow the concert. Proceeds for the concert will go to support young artists and musicians through grants and scholarships funded by the Charlotte Area Foundation for Music and Handcrafted Art. Vivace Strings will be playing at Deer Stone Lodge, home of Dr. and Mrs. George Pinsak, for the Dream Home Open House on Saturday, November 6th 2010. This is 120 acre custom built Montana style estate has magnificent panoramic views from 148 over-sized windows. The tour also includes collector automobiles in a porte-cochère, a garden, and green houses. Home baked refreshments, mulled wine and punch will be served. The open house will go from 2:00pm until 6:00pm, and Vivace Strings will play for approximately one hour beginning at 3:30. Shuttle service will be provided from the parking lot at Sunset Dr. and Hayne St. in Monroe. Admission (adults only) is $25, and the proceeds will benefit the Union Symphony. Are you looking for something fun and musical to do this coming Sunday? Come to the Batte Fine Arts Center at Wingate University for a great concert featuring the music of Beethoven, featuring Sara Saba on the piano. The concert begins at 4:00pm with pre-concert lecture by Mekel Rogers beginning at 3:15. And don't miss our Vivace Strings performance before the lecture at 2:45. Admission is $15 and includes a reception to follow. The string ensemble that I lead, Vivace Strings, did an hour long performance Friday, October 1st at the Art Walk in downtown Monroe. The Art Walk is a venue for local artists to display and sell their art at various galleries in the downtown area. Vivace Strings played in the Loft, which is a great open space with excellent acoustics. They did a great job and were received very well. I filled in on the cello and had a great time playing with the group I normally lead. It lent me a whole new perspective, and was also a lot of fun.